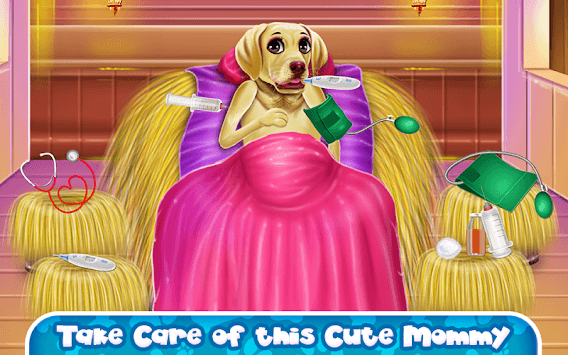 Have an unusual experience with this puppy game and try to discover the secrets of giving birth. As you may know, a pregnant dog is a big responsibility and if you want to be prepared for when you will start the journey you should definitely try to check all the health verifications. The mom will go through some medical routine procedures in order to be ready. First, you will check her pulse, then you will inject some vitamins, the body temperature and the heart beats are next. Use the special ultrasounds device to see the baby in the belly. Help her to get in the perfect mood for birth-giving and encourage her to push in order to get out the little puppies. Rush in the nursing room to wash the babies and there check if the vital signs are established. Now your concern will be the babies and their medical condition. So, get each one of the quadruplets in the bath tub and make sure you offer a cleaning and fun bath. Once the bath is over you will dry their fur and apply some eye drops, maybe you could clean their years too. Follow the instructions and move along to the decorating part. First, you will make sure the room they will stay in will have a perfect environment for them. Next, you will dress up the mom and the little Labradors with delightful outfits. Use all the arsenal you've got and come with a matching design for the welcome room in which the party of homecoming will be held. Have fun!